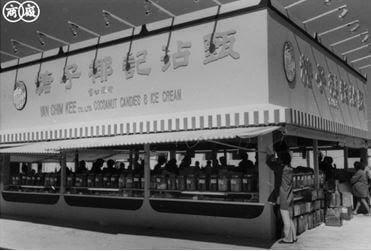 The history of the confectionery industry in Hong Kong would not be complete without including the history of Yan Chim Kee, the prominent maker of coconut candies and ice cream. Founded in 1915, Yan Chim Kee has gone through a century of ups and downs and even disappeared from the market for a few years in the late 2000s but has since re-emerged and continue to cater to lovers of coconut-related goodies. In 1927, Yan Lun-lap passed away and his 19 year old son Yan Choi-Yuen (甄彩源,1908-1970) took over the business. The firm opened a branch in Canton (with its own building) and by the 1930s, its products, which were registered with both British and Chinese governments, were marketed in Macau and coastal cities such as Shanghai and Tientsin and exported to America and Southeast Asia. In 1938, the Japanese occupied Canton and the Yan Chim Kee store there was looted. During the Japanese occupation of HK, Yan Chim Kee’s production was significantly reduced and in the early years after the War business was challenging even with contracts from the government to manufacture a variety of candies. In 1947, its daily candies production was 2000 pounds. In 1953, Choi-Yuen purchased a parcel of land in the fishing village of Wong Chuk-hang to build a 4 story vacation home. In 1957, Yan Chim Kee was in the headlines as one of its staff Yan Woon-kiu attacked four fellow colleagues (all with the last name, Yan) at the 65 Caine Road store with a knife, for which he was sentenced to 6 years in jail. The following year, Yan Chim Kee decided to move its production to Wong Chuk-hang and converted the family vacation home on 27 Wong Chuk Hang Road into a plant, hiring locals from fishing families as workers with the men chopping coconuts and females wrapping the candies. 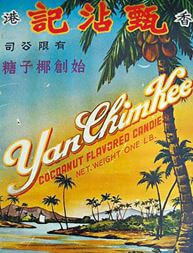 In 1962, Yan Chim Kee acquired state of the art candy machinery through China Engineers which was capable of wrapping 600 pieces of coconut candies per minute. (the manager at China Engineers at the time was Hu Fa-kuang, who later started Ryoden Group and became a Legislative Councilor). A two story dormitory was also provided to workers and the firm was known for its proper treatment of workers. Yan was active with the CMA and the firm participated in the HK Products Expo as early as 1940 although it was lower key compare to some of the other firms. He was also active with the Confectioners & Bakers Association and donated candies to children and charitable causes. In 1970, he died at the age of 62 and was survived by 10 children. The business was succeeded by his sons Julian Yan Kwok-kin (甄國鍵, rank 5) and Gay Yan Kwok-kee (甄國基, rank 7)and the focus was shifted to ice cream. In 1982, the firm replaced Kowloon Dairy as the exclusive distributor of Magnolia ice cream manufactured by San Miguel. It also invested heavily in TV advertising for its ice cream products in the 1980s and in 1985 launched a very creative marketing campaign partnering with Japanese cartoon GodMars. In 1990s, the firm moved its production to the mainland and the Wong Chuk Hang plant was re-developed into Yan’s Tower in 1995. The move to the mainland proved disastrous and combined with other factors, the firm was declared bankrupt in 1999 and production ceased in 2006. One of Choi-yuen’s daughters Evelyn Yan Yin-yin (甄賢賢 rank 9) decided to revive the brand in 2011, starting out with selling coconut flavored Chinese New Year cake at the HK Products Expo that year. Thanks to the help of food distributor and supermarket operator Tung Tai Hong, the brand regained distribution foothold and soon its coconut candies, coconut egg rolls returned to the market with production being done in Malaysia. A marketing partnership was formed with designer Keo Wen and Yan Chim Kee speciality stores were opened within Eslite stores while Evelyn retained brand ownership and control of R&D and production. This article was first posted on 19th May 2017. Yan Shing Kee (甄誠記) closed the retail shop in 2014 but the company is still in the business of manufacturing coconut and other candies.